It seems like only yesterday when engines adorned with blazing, red center, circular heralds blasted out of Panther Creek Valley, crossed eastern Pennsylvania, the Lehigh River, and Delaware River to New Jersey hauling endless hopper car loads of black diamonds destined for Maybrook, NY, the railroad gateway to New England. The Coalfield, Slate Belt, and Cement Region are all photographically represented, as well as right-of-ways, stations, terminals, and branch lines along the L&NE’s entire east-west main line. 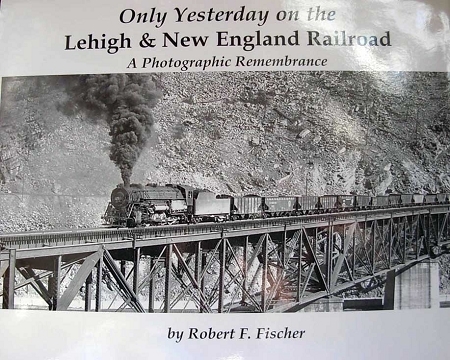 Only Yesterday on the Lehigh & New England Railroad – A Photographic Remembrance is the most voluminous, most comprehensive, most meticulously researched photographic presentation revealing the L&NE ever offered. All aspects of the company are reviewed and illustrated, including corporate history, relationship to the Lehigh Coal & Navigation Company, development of the physical plant and rights-of-way, locomotives, passenger cars, revenue freight cars, and non revenue cars with emphasis on the 1947-1950 steam-diesel transition years…this is a no nonsense presentation that not only tells you, but also shows you!